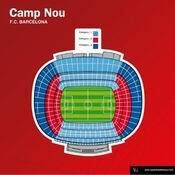 Tickets for FC Barcelona are extremely difficult to find, since there are almost as many club members ("socios") as there are seats in the ground. Members have first priority when it comes to purchasing tickets and they are also allowed to purchase tickets in advance via any of the different sales channels. Tickets for the general public go on sale only 15 days before the game, and by that time the most important games have almost certainly sold out. Furthermore, for Champions League games, tickets are sold to the general public only at the official ticket offices at the stadium. So, if you really want to be sure of getting tickets for Barça's games, especially for the most important ones like FC Barcelona - Real Madrid, you will have to use the online option. Online tickets are probably a little more expensive, but at least they provide a way of being 100% certain of obtaining your entrance to the match. Preferred seating is available for almost all games and the prices reflect the supply, demand and seat location (in other words, the more important matches will be more expensive). Please click here to see all FC Barcelona games in the future. Choose which game you would like to attend from the list of upcoming FC Barcelona games. Please note that in Spain, the day and time of kick-off is only confirmed the week before the match, with most games being played either on Saturday or Sunday. One or two weeks before the game, the dates and times of the following weekend matches are updated. In European competitions match details are mostly known in advance. Within seconds you will receive an e-mail confirming your order details, including the number of tickets and category.